U.S. Civil War Draft Registration, 1863-1865: "John Thomas, Sr., age 31 b. Abt. 1832 Kentucky, married, 6th Cong District, Perry, Marion County, IN." 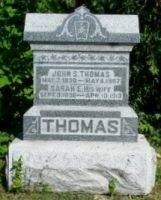 Indianapolis, IN Directories, 1887-1890, years 1889 & 1890: "John S. Thomas, 304 Yandes, laborer." 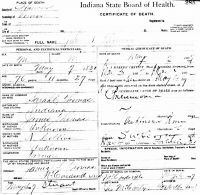 Born - 7 May 1830 - Nicholas County, Kentucky, U.S.A.
Married - 2 Oct 1856 - Indiana, U.S.A. Buried - - McCordsville Cemetery, Hancock County, Indiana, U.S.A.